ISIS-linked Salafist group in Gaza threatens to kill 'one by one' all Hamas personnel in retaliation for arrests of some 40 of its members. 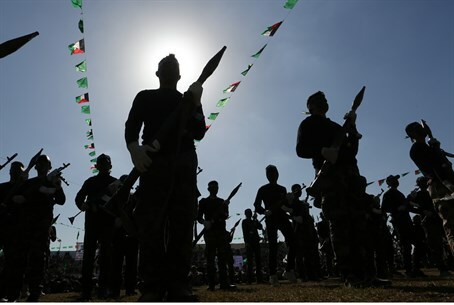 Tensions between terror organizations Islamic State in Iraq and Syria and Hamas in Gaza have intensified in recent days, Maariv reported on Wednesday. Clashes apparently spiraled after Hamas demolished a mosque used by members of the Salafist organization called “Islamic State Supporters in Beit Al-Maqdis" as well as arrested nearly 40 of its members. Reportedly, Hamas arrested the dozens of Salafists as well as several prominent Islamic State preachers in Gaza, following the Islamic State takeover of Palestinian refugee camp Yarmouk, near Damascus. "After ISIS beheaded several Palestinian, including a senior Hamas official," inside the camp in April, the International Business Times reported, "the Palestinian Intelligence agency swore that it would avenge the killing of its personnel." In response, the ISIS-affiliated group in the Hamas-controlled coastal enclave called Hamas "worse than the Jewish and American occupiers" and issued a proclamation on Monday giving Hamas 72 hours to release its detained members. If not, the "ISIS Supporters in Beit Al-Maqdis" asserted they would kill, one by one, all of Hamas' personnel. Claiming it has data on all the names and addresses of those working for the Palestinian Intelligence Agency, the pro-ISIS group in Gaza went on to accuse Hamas of working for Israeli forces. Despite concern of an escalation, Hamas has tried to reassure the Gazan public that the security situation is stable. "Residents can tour Gaza without need of a weapon from Rafah to Beit Hanoun," Interior Ministry spokesman Iyad al-Bazam wrote on his Facebook page.